Mornings are best and the worst. Best, because it signals a new day, but getting up to meet the new day can turn out to be quite a daunting task. However, if you are a morning person, the aforementioned is not applicable to you. 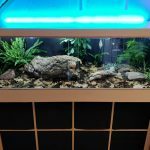 For the rest of us, we seek every possible wake up contraptions that could have a shot in beating the determined, semi-conscious us who, to be honest, can be quite brutal to any alarm clock that stands in our path back to la la land. 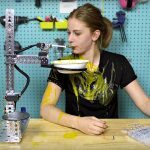 Chasing after a wheeled alarm clock and diffusing a ‘bomb’ are some of the methods used, but none of them will be as brutal as electronics tinkerer Simone Giertz ‘Face-slapping Alarm Clock’. 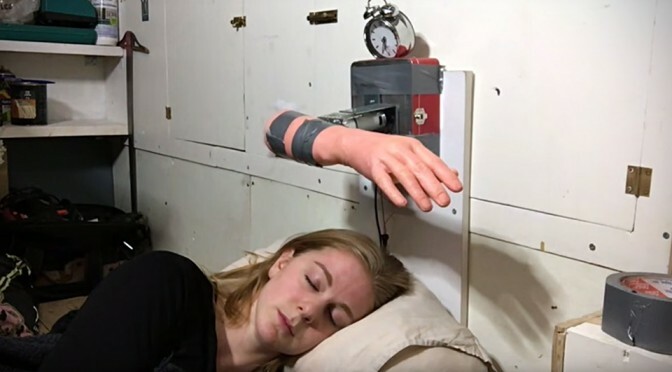 Officially called The Wake-up Machine, it is a composition of a rubberized fake arm, a standard alarm clock and a powerful brushed DC motor that runs at 165 rpm – rigged to an Arduino UNO that will wake her up in the cruelest way possible: slapping her awake. Who in the world would want that to begin a new day? Well, I guess if getting out bed each morning proves to be a mission impossible, then I supposed this would do, albeit the lack of sophistication. You know what they say, drastic times calls for drastic measures. 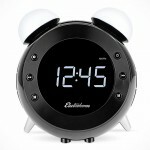 Catch The Wake-up Machine in action in the video below.